In 2016 food consumption in the Netherlands amounted to EUR 57.1 billion, contributing almost 10% to the Dutch Gross National Product. Almost one in six Dutch industrial employees work in the food industry. 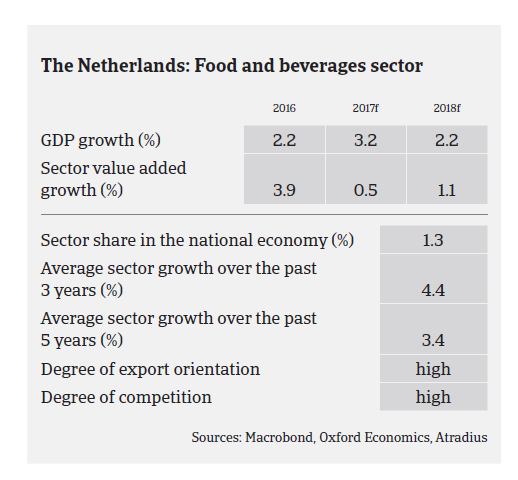 Value added growth of the Dutch food and beverages sector increased 3.9% last year, and is expected to rise further in 2017 and 2018, by 0.5% and 1.1% respectively. Robust private consumption and an envisaged tax law change in 2018 should help to support growth in food retail sales. Due to changing consumer habits the sustainable food segment has become one of the most important growth segments in food retail and food service. In 2016 turnover of sustainable food totalled EUR 3.8 billion, up 26% year-on-year, with its market share increasing from 8% to 10%. Sales of Dutch supermarkets amounted to EUR 34.5 billion in 2016, increasing 2.5% year-on-year, mainly due to further growth in the private label products segment. Supermarkets sales volumes are expected to increase 1.5% in 2017. Traditional grocery stores (butchers, bakeries etc.) increasingly experience the strong competition from supermarket chains which have further improved their assortment. Therefore traditional stores have to become specialty shops, pastry and high-end caterers. 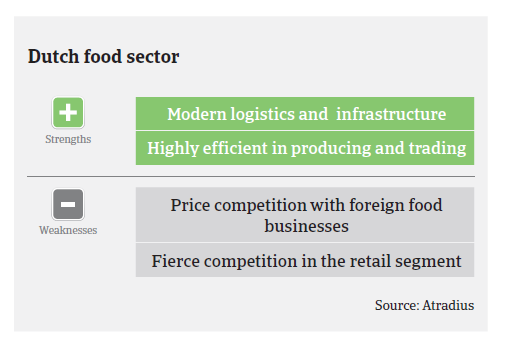 At the same time pressure on traditional supermarket chains is also mounting due to increasing competition from discounters, out of home, city and convenience stores (at high traffic locations), non-food outlets, and online food sales. With the growth of delivery platforms, delivery services and pick-up points, online food retailing is gaining momentum. While the market share of online food retail is still small (2.2% in 2016), many indicators are showing that it will increase sharply in the coming years, up to 9% in 2025. In 2017 and 2018 restaurant and catering turnover is expected to increase by more than 4.5% annually. The future for the Dutch food service industry looks bright, with annual growth rates expected to increase from 2% to almost 3% in 2020. Driven by millennials the Dutch eating culture is changing, as eating at home is shifting towards eating while traveling, working or eating out with friends. Food choices and eating moments are becoming more tailor-made and individual, which will have a positive effect on consumer spending in food service outlets. Data driven technology platforms can put distributors in the prime position for fundamentally changing the way consumers shop for food. Single food delivery start-up Takeaway.com NV went public with a EUR 1 billion valuation in September 2016. The Netherlands is one of the world´s largest exporters of agricultural-food products, second only to the US. The meat processing and the dairy industries, with sales shares of 16% and 19% in Dutch food exports respectively, are the most important sectors within the food export industry. 12 out of the 40 largest food and beverage companies in the world have major production sites or R&D facilities in the Netherlands. Dairy production and export value increased 3% in 2016, with the share of exports to Asia meanwhile amounting to 20%. It is expected that milk powder and butter prices will increase further in 2017 and 2018 due to higher demand from Chinese customers. While meat consumption stagnates in Europe as the main export destination, exports to Asia sharply increased by more than 40% in 2016, and further increases are expected in the coming years. Due to the robust domestic demand and good export performance, profit margins of many food businesses have increased in 2017. Banks are generally willing to provide loans, while the indebtedness of small and mid-sized Dutch food companies (excluding smaller businesses with less than 10 employees) is very low compared to their peers in other EU countries. 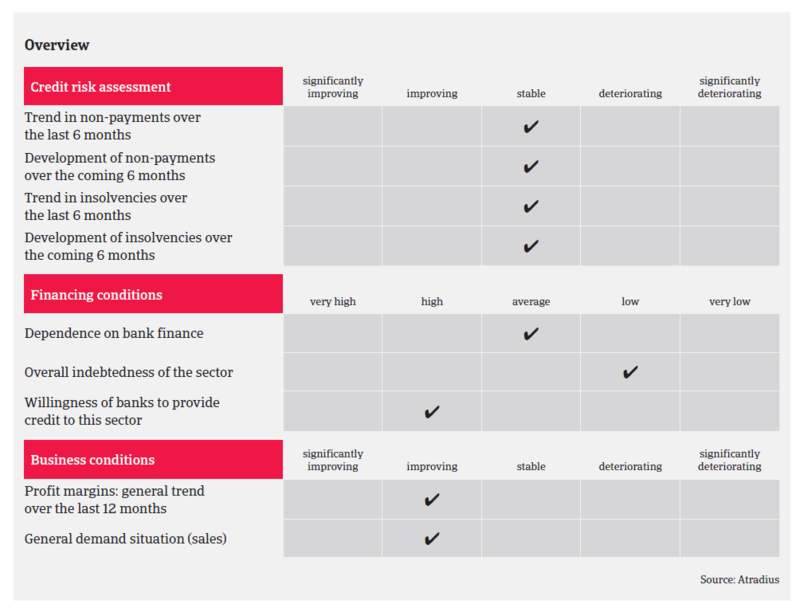 The average payment duration in the sector is 40 days, and the amount of payment delays, protracted payments and insolvencies remains low compared to other Dutch industries, with no major changes expected in 2018. Out of the 1,573 Dutch businesses (excluding sole proprietorships) that went into insolvency between April and September 2017 only 82 were food-related companies. Therefore, our underwriting stance remains open for the food industry. However, the strong export orientation makes many Dutch food businesses susceptible to geopolitical risks, export restrictions and price/currency fluctuations. The Russian import ban has hurt the fruit and vegetable trading sector in particular, while Brexit threatens to disrupt food trade with one of the Netherlands´s most important export partners. Food exports to the United Kingdom already decreased 2% in 2016, mainly due to the pound sterling depreciation since the Brexit decision.